Deciding whether to get trached and vented is perhaps the most consequential decision you will make. This procedure will likely prolong your life, but it can come at a great expense to you and your family. It does not slow down or reverse ALS. If you would not want to be trached and vented in the case of emergency breathing difficulties, you can fill out a Do Not Resuscitate (DNR) form, which prevents doctors or emergency responders of attempting CPR or other life-saving techniques. Should I get a tracheotomy? This is a very personal decision. Only you and your family will know what is best. Unlike a feeding tube, this is a decision that cannot be reversed. In the United States, fewer than 10% of ALS patients get trached and vented. If you are considering getting a tracheotomy, discuss the pros and cons with your neurologist, ALS Clinic team, and ALS Association care services coordinator. It is also important to talk with your loved ones, because once you are trached and vented, you will need skilled 24/7 care. Most families cannot afford full-time professional care, which means that the family becomes full-time caregivers. What are the pros and cons to this procedure? The main reason people choose to get a tracheotomy is so that they can live longer. Because of loved ones, work, or simply the desire to live, some people prefer to live with the limitations that come with 24/7 ventilation. Once you are trached, the ventilator will breathe for you when your respiratory muscles are no longer strong enough to breathe on their own. You will probably need to be attached to the ventilator 24/7. You will need 24/7 skilled care.​ Professional care is very expensive and not covered by Medicare, which means that family and friends usually provide the full-time care. You will no longer be able to speak. When should I get a tracheotomy? When noninvasive breathing support from a BiPAP machine is not sufficient, the invasive breathing support from a tracheotomy and ventilator will breathe for you and help you stay alive. If you decide to get trached and vented, you will want to make the decision well ahead of time—before you are really struggling to breathe with a BiPAP. Again, be sure to discuss this decision with your family, including the cost and care that it would entail. 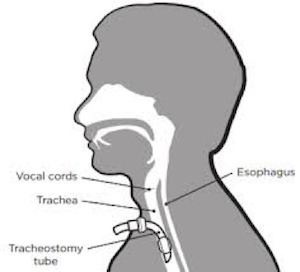 If you are considering a tracheotomy, your neurologist will refer you to a pulmonologist for consultation. The pulmonologist can answer all of your questions regarding the procedure and rehabilitation. Getting a tracheotomy is much more involved than getting a feeding tube. ALS patients often remain in the hospital for two to four weeks after a tracheotomy. You will need to go to a rehab facility to learn how the ventilator works, and your personal caregivers will need to be trained before you go home. At home, you will be attached to a ventilator machine, which will breathe for you. Your caregivers will know how the machine works and will need to make sure that it is working properly. Most ALS patients will be on the ventilator 24/7, though some patients can disconnect for short periods of time during the day. Once you are on a ventilator, you will need to get all of your food, liquids, and medication through a feeding tube. If you do not already have a feeding tube, you will receive one when you are under anesthesia for the tracheotomy procedure. What if I decide to stop using the ventilator? If you decide to disconnect the ventilator, your breathing will take its natural course. If your respiratory muscles are greatly weakened, then your breathing will likely slow before stopping altogether. ​Patients who decide to go this route often bring hospice care into the home and receive sedation before removing the ventilator, which can help minimize breathing distress and provide a more comfortable end-of-life experience. Is it expensive to get trached and vented? Ask your medical providers to give you an estimate ahead of time for what you will need to pay out of pocket. An expensive part of being trached and vented is usually the 24/7 care you will need once you are home. Medicare will not cover long-term home care if you are on a ventilator, and most insurance policies won’t either. If you decide to hire 24/7 skilled nursing care, it can cost over $20,000 per month, which is why family members usually become the full-time caregivers. What if I decide to not get a tracheotomy? Most ALS patients in the U.S. decide against tracheotomies because they either don’t believe their prolonged quality of life will be worth the cost and limitations or they do not want to burden their family members. If you decide against the procedure, you can still use a BiPAP machine for breathing support. However, if your respiratory muscles weaken enough, you will struggle to breathe and to get sufficient oxygen. At this point, many ALS patients begin receiving hospice care, which can administer drugs to provide a more comfortable end-of-life experience.